Exit Highway 5 at the north end of Camp Pendleton on Basilone Road. Turn uphill (East) to the guard station. You will be required to show a photo ID and state your purpose for the visit. Proceed about 150 feet to Basilone Road and turn right. Drive to the first stoplight (about three quarters of a mile) to Beach Club Road. 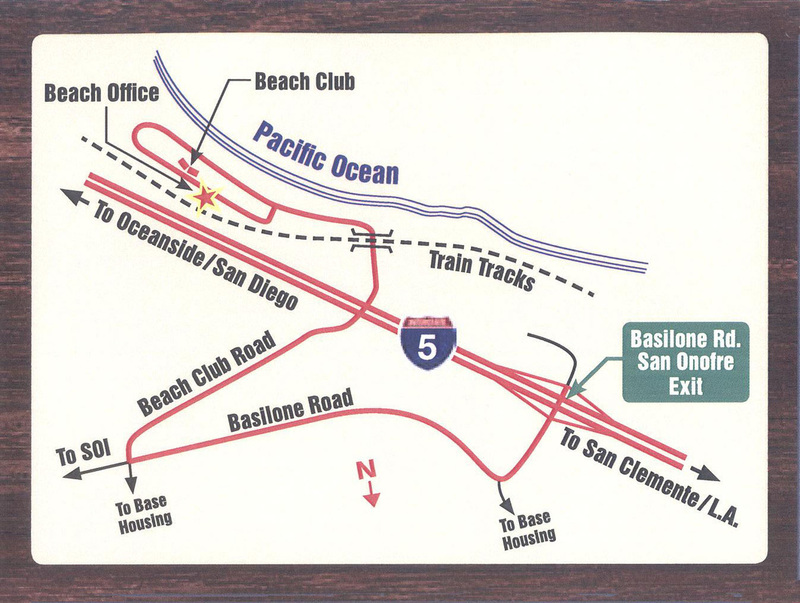 Turn right on Beach Club Road and follow this road under Highway 5 and the Trestles to the Beach. Go South past RV campsites to the first left which will take you up the hill behind the row of cottages. You will pass the row of new Cottages. The office is directly ahead on the left.